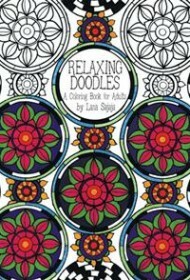 Sajaja clearly understands the most important element of adult coloring books, as evidenced by the term “relaxing” in the title: The best adult coloring books offer designs that are interesting and challenging, but not so challenging that a would-be artist would become stressed trying to complete a picture. It’s a delicate balance, but Sajaja manages it here with a good mix of easy and more complex designs. Her 49 artful patterns were inspired, she writes, by “doodle tangles, the ancient art of Mandalas, lettering, geometrical shapes, and Persian paisley designs.” Some pictures have a wonderfully floral, kinetic feel, while others are intriguing geometrics. Sajaja adheres to the best practices of this popular genre. First, her coloring book has art on only one side of the pages, which keeps the colors from bleeding through and makes them easier for framing. Second, the designs are artful enough to be worthy of framing once the colorist adds his or her personal touch. The author suggests users enlarge the images “to have a better color effect on the wall” — good advice, particularly with a few heavily lined images that appear to be a bit crowded in their current size. Overall, these are beautiful designs that seem to bloom right on the page, even without colors. For any adult who wants to try his or her hand at a new hobby, Sajaja’s coloring book may be just the excuse to put down the knitting needles and pick up the periwinkles and the tangerines.